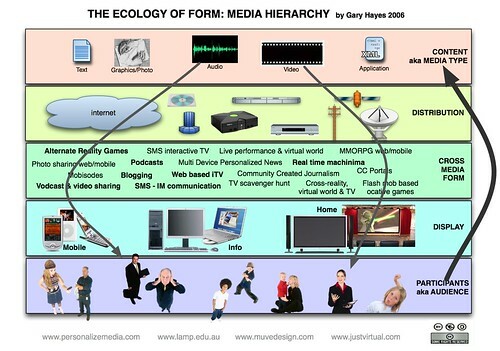 Diagram firstly shows how you can dis-associate the content types, from the distribution (web through to scarcity broadcast) from the four areas of displays you see it on. 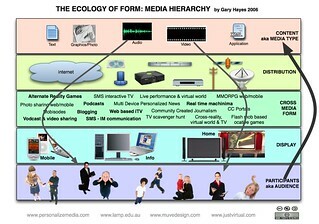 The cross media form is about how random combinations of platform, distribution, content types go to make up new types of services. More here personalizemedia.com - A range of charts created by Gary Hayes across games, social networks, cross-media, broadband services, virtual worlds. Used in various presentations already and all marked as creative commons - attribution, non-derivative, non-commercial.